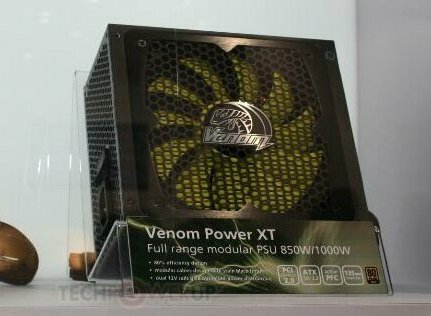 Akasa revealed the Venom Power XT, its new enthusiast power supply lineup, at Computex. This series will initially include 850W and 1000W models that are cooled by the firm's 135mm Viper fan. The Venom Power XT uses a dual +12V rail design and has semi-modular cabling. The PSUs are partially modular, with a few essential cables such as 24-pin ATX, 4-pin / 8-pin ATX/EPS, and a pair of PCI-Express connectors being fixed. Additional pairs of PCI-Express power connectors, SATA, Molex, and Berg connectors will be modular. 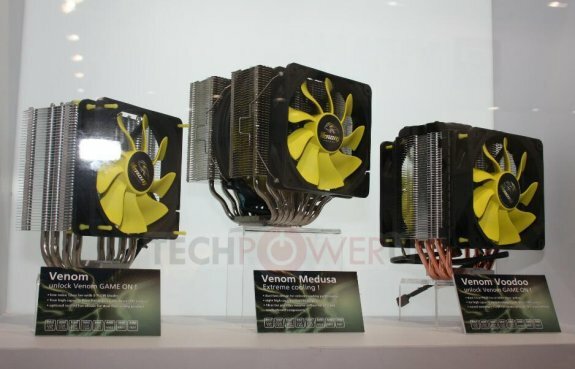 TPU also got to see the Venom Medusa, a new entry in the company's Venom HSF lineup. The Medusa features eight direct-touch nickel-plated copper heatpipes, two aluminium fin arrays, a 120mm Viper fan that pushes the air through the first stack, and a round 140mm fan in the middle. Additionally, there's also the possibility to attach a third 120mm fan to pull air from the second stack. The Venom Medusa supports nearly every modern CPU socket type, including LGA2011, LGA1155/LGA1156, LGA1366, AM3+/AM3, and FM2/FM1.